Fan for 15 years of the sports events organized on the “Le Mans” circuit, I was very enthusiastic last year to join the team of my friend, Alain from Le Mans and to participate to the “24 Heures Vélo” for the first time. A lot of emotion to have the Australian flag being flown and the National Anthem being played just before running across the track to my bike to start the race! Very pleased of this first experience and of the very good atmosphere in 2017, the 6 mates of my team VELOROO (Alain and his 2 sons, a French friend, and English friend and myself, Australian) haven’t hesitated to repeat the adventure this year. As organizer of cycling tours in the South of France and in the mountains, my dream would be to enrol in 2019 (or in the near future) another VELOROO team which would be the first all (or 100 %) Australian team in the “24 Heures Vélo” in Le Mans and to make Australians discover this famous race and this amazing international event! I would like to say a big thank you for the great weekend. We are the three teams from the Young Lewisham Project, teams 223, 224 + 451. None of us had taken part in a cycle race before but our legs are letting us know that we have done a race now. It was a privilege to be a small part in the event and to ride with such fantastic riders. The race has helped us raise money for the work we do with young people in south east London. One of our young people was able to take part. Tekluhamanot is an 18 year old refugee from Eritrea and the weekend was a life changing experience for him. Please pass on our thanks to everyone who helped organise the weekend especially Andre who was very welcoming and helpful. There are plans to come again next year so we will see you then. Coming from Greece to ride on the legendary Le Mans circuit and to push my limits. I am looking forward this summer to ride the Le Mans cyclosportive and represent Atlas Team Greece during this competition. I am doing a number of cycling challenges this year for the UK charity, Bloodwise, who research cures and treatments for blood cancers as well as provide much needed support to those who are suffering from these terrible illnesses. The reason I am taking on these challenges is because in 2002 my Grandad died from Leukaemia, he was and still is a massive inspiration to me. 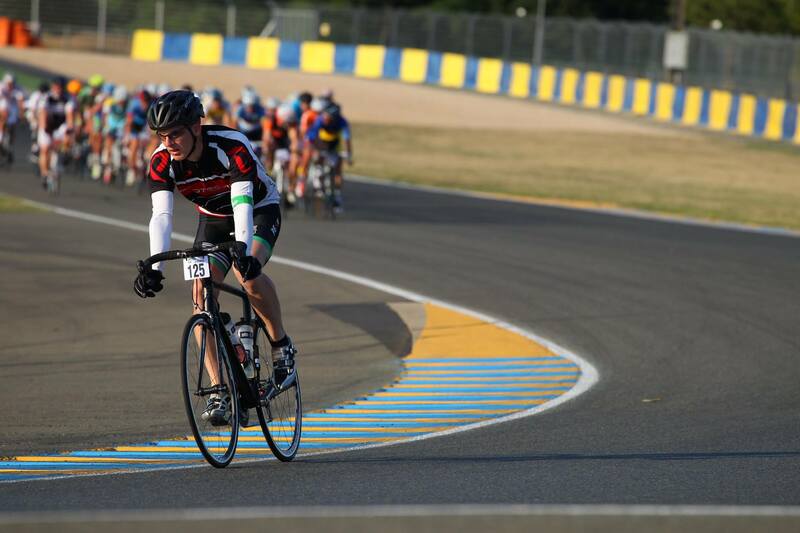 The Le Mans circuit was also a huge reason for taking part in this unique cycling event. I visited the Le Mans circuit as a child and have never forgotten it; so to return and actually be able to cycle around this famous circuit is a massive privilege. My aim is to finish this cyclosportive race and help raise as much money for the charity as possible by cycling for as long as I can throughout the 24 hours. If I feel good who knows I might try and go for the quickest lap! I will hopefully have completed Land’s End to John O’Groats, L’Ardechoise Velo Marathon and Prudential RideLondon before the start of the event and the week after I will be cycling the 160kms RiseAbove Sportive. I also aim to climb Mount Ventoux and Alpe D’Huez sometime this year. This year a large group of Danish cyclists are participating in Le Mans 24 h cycling race. It all started in 2014 where six Danish cyclists were invited to join Schneider Electric’s teams in Le Mans 24 h bike race due to some late cancellations. The six Danes went to Le Mans knowing absolute nothing about the race and what to expect. But what a weekend! Being there, experiencing the “Le Man start”, and riding on the track late at night in the dark getting passed by the fast cyclists on their carbon wheels, attacking the Dunlop hill again and again, breathing the air and atmosphere of the track. This left them with a feeling that they had to return. The six Danes knew each other from a charity cycling team that every summer cycles from Denmark to Paris; 1250 km in one week whilst collecting money for children with cancer and their families. When back in Denmark they reached out to their network and within two weeks enough people wanted to join and they enrolled six teams. The Danish teams are a diverse group of cyclists. They are all amateurs and some are more experienced than others. The oldest is over 70 years of age, the youngest early 20, two with only one leg but all with the common love for cycling. For Le Mans 2015 the Danish teams are eager to ride the famous track which most of them only know from watching motorsport on the television. Please pay attention to the riders in the jerseys with the Viking logo and the Danish flag and give them a big cheer as you cycle next to each other. Photo: The Danish teams met up for their first training on a lovely sunny afternoon in April. The wind was strong but everybody was in high spirit. My name is Neil Moss, and I am a solo rider in this year’s race, with team name “NeMo Velo Solo”. I am 45 years old, and live in the Herault region of France. I discovered the event when reading a French cycling magazine. My wife and I moved to France from Scotland in 2013 and she suggested I buy something to read to improve my French. There was a large article on the 2013 event, showing hundreds of riders climbing to the Dunlop Bridge, and I decided straight away that it was something I must do! I wanted to discover my limits – riding solo is the only way that this can be done, and riding at Le Mans is the perfect environment – smooth roads, no traffic – no excuses! My objective is to ride continuously, for at least 22.5 hours, and finish the event. However, I will also try to complete 120 laps to break the 500km barrier. My team name “NeMo Velo Solo” comes from my nickname at work – NeMo is short for Neil Moss. The team name is just something short for Twitter – http://www.twitter.com/nemovelosolo – but it describes everything. Although I am the only rider, the event would not be possible without the help of my wife, who has volunteered to be my support crew! I am training hard – long rides, fast rides, hills and rollers – and I am looking forward to competing very much.